TV journalists leave Sendai area due to fear of radiation leaks in Japan. Tokyo, Japan, March 15th: The threat of radiation leaks from the Fukushima nuclear plant is making broadcast companies re-consider their coverage plans. Having only just reached stricken areas such as Sendai, some TV journalists are now leaving because of the potential dangers coming from the volatile nuclear plant. Even being based in Tokyo is considered a risk. 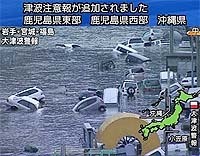 The head of foreign news at ZDF, Thel Koll, told TVZ, "We have called back our people from Tokyo to Osaka. We have only three people left in Japan and from now on they will be in Osaka. It was considered to be safer because there could be nuclear fall-out drifting towards Tokyo." TF1, which has two crews in Tokyo, has decided to move one of them out to Kyoto and is deliberating where to base the second one. Fellow French broadcaster France24 despatched its correspondent from Thailand when the earthquake story broke and is now considering sending a back-up team from Paris. However, due to the radiation dangers it plans to send in the crew with protective clothing but a spokesman told TVZ that "this type of clothing is not easy to find". Spain's Telecinco has a team based in Tokyo and says that, for the time being, it has no plans to move them out. Russia's NTV has a correspondent and cameraman in the Sendai area but they face a major problem getting out. Foreign news producer, Irina Bagriantseva said, "The driver who's with them ran out of gas - no petrol at all. So the crew won't be able to leave for now. They are definitely staying there for tonight and then maybe tomorrow as well."